Amelia (Essie Davis) is a single mom who has been having troubles with her son Samuel (Noah Wiseman). Amelia's husband was killed in a car accident while taking her to the hospital to give birth to Samuel. Samuel, now 6 going on 7, lives in constant fear of monsters and builds weapons to protect himself from them. Samuel's tendencies have caused him to be ostracized by other kids and he has been singled out at school as disruptive. One night, Amelia lets Samuel pick out a bedtime story, and he chooses Mister Babadook, which turns out to be a horror story pop-up book about a murderous entity. From that night forward, Samuel starts to claim he sees the Babadook more and more places in real life, making it harder and harder for Amelia to deal with him. As Samuel's 7th birthday approaches, Samuel gets worse and worse with his claims about the babadook. Amelia is always depressed this time of year anyway since it's when her husband died, but now she starts to think her son is crazy with all of his visions of the Babadook, and when he starts having fits, it makes things that much more stressful. When Amelia starts seeing strange things and hearing strange voices, she starts to think Samuel might not be crazy after all and that the Babadook may actually exist...or does it? I read somewhere recently in my internet travels that, when it comes to horror movies, there's a difference between being startled and being scared. Many modern horror flicks make it their mission to "jump scare" the crap out of its audiences, tricking them into thinking that what they have just watched was "scary," when really, it was more startling than anything. Who wouldn't be startled when a creature pops out of the dark and the volume skyrockets to an ear-bleeding level? PG-13 horror movies are the worst offender of this, and since they cannot show any large amounts of gore or blood, jump scares are pretty much all they have left. 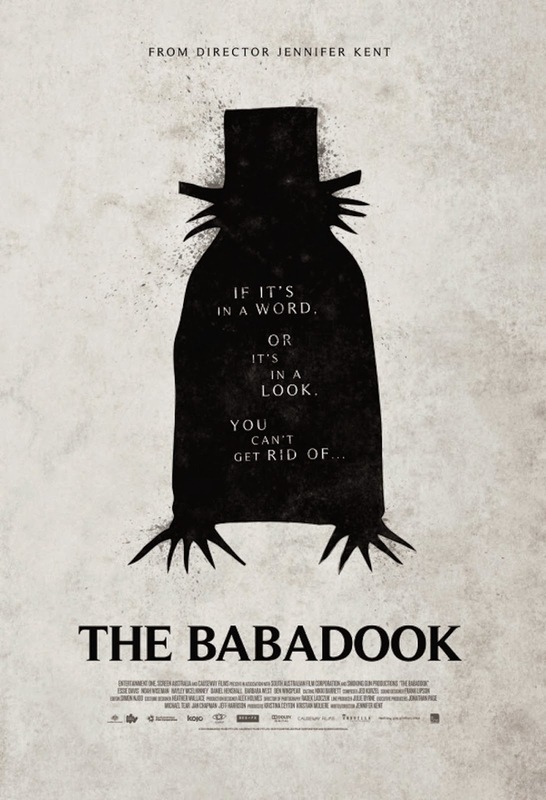 That being said, we consider "The Babadook" scary in more ways than one. We have heard a lot about this movie is one of the year's best and we were excited to see it available online to purchase since it was not playing anywhere near us. It definitely did not disappoint. This movie doesn't rely on cheap thrills like the aforementioned jump scares, or blood and gore. While not scary in the traditional sense, the bulk of the movie relies on setting an eerie mood, telling a rather disturbing story and backing it all with a creepy and mysterious soundtrack amidst a dark, thought-provoking plot. It's a deeply psychological horror that deals with a mother's descent into both grief and madness as she deals with a behaviorally challenged son, but while also never fully coping with the death of her husband. Essie Davis' acting is superb, and we see the anguish and the strain that Samuel puts on her in her face, as well as her demeanor. She is not treated as a flippant character, but rather, she is a raw, honest and serious portrayal of just how hard it is to be a single parent: tired, restless, angry, desperate, at her wit's end...she will do anything for a single moment's peace. Noah Wiseman does an equally excellent job as Samuel, a child with some sort of behavioral problem that is an unruly, disobedient, monster-seeing brat. These two characters are extremely well developed and are both complex enough that the audience feels like it gets to know and understand them and their problems. We feel for Amelia and her lack of sleep and peace and quiet, but we're also understanding that Samuel is sincerely frightened of monsters. He also has the added disadvantage of being born on the same day that his father died, and this came with a hefty emotional load and obvious, albeit unintended, resentment from his mother. If this movie isn't enough reason to showcase why we don't want to have kids, well, then you'll never understand how we feel. It's never made abundantly clear if the Babadook is real. It could have been a mental manifestation of Amelia and Samuel's grief. Or, it could have been a nightmare that's all in their minds. Or, it could have been an actual monster tormenting them. The imagery of the movie is very unsettling. Though it may never make you scream, it will absolutely make you feel uneasy. Even tender scenes between Amelia and Samuel become distressing since the audience never fully knows if she is going to be gentle and soothing or snap Samuel's neck.